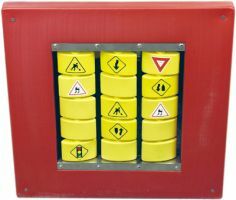 Exercise memory and improve motor skills with the Traffic Memory Wall Panel. Kids can play a fun flip and match game with the traffic symbols permanently printed on the flip blocks. Busy Cube wall panels are great for schools, homes, waiting areas, or playrooms.